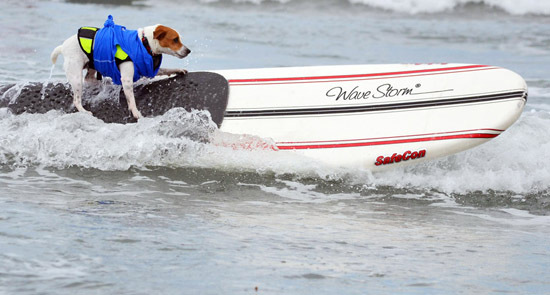 Surf dogs are for reals! I work at the non-profit Helen Woodward Animal Center in Rancho Santa Fe and we hosted our seventh annual Surf Dog Surf-A-Thon, bringing in $75,000 recently. More than 4,000 beach, surf and dog-loving fans showed up to join in the fun, coming from as far away as Australia. As much as we give our pets tender loving care, a common ailment that we often see are anterior cruciate ligament (ACE) tears. 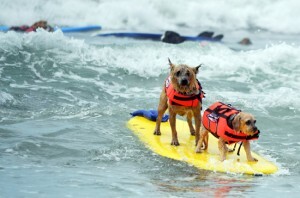 And it’s not just sporting dogs, like these surf dogs, who tear their ligaments. Even active and inactive dogs, and cats on rare occasions. There are two cruciate ligaments: anterior (cranial) and posterior (caudal). Located further in front of the knee joint, it keeps the shin bone from slipping forward. When the ligament tears, the knee is unstable. Each and every step taken by a dog or cat causes the shin bone to slide forward. That means more wear and tear on the knee joint. The body’s response to this instability is to create scar tissue to try and stabilize the joint. This ultimately leads to arthritis. What causes it to tear? In dogs and cats, anterior cruciate tears can be sudden or progressive in nature. In acute, sudden cases, trauma usually incites the tear. Hyperextending the knee joint and rotating it internally causes the ligament to tear. This can happen when the animal steps in a hole, turns suddenly, gets stuck in a fence, or jumps with enough force to break the ligament. Chronic, progressive cases usually involve multiple factors. The most common risk factors include obesity, conformation abnormalities, and immune mediated diseases. Dogs and cats with ACL tears have rear leg lameness. It can vary from intermittent toe-touching lameness to not using the limb at all. It can happen all of a sudden or be more gradual in onset. In partial tears, the symptoms wax and wane. A variety of tests can diagnose a cruciate tear. Your vet will manipulate the knee joint and find instability and sometimes joint swelling. X-rays can also show joint effusion but are mostly used to rule out other conditions that cause limping. The definitive diagnosis is an MRI. Many surgeons opt to take the pet to surgery and explore the joints. This eliminates the need for an additional anesthesia procedure that your pet would have to undergo. In small dogs, conservative medical treatment may work. This involves giving your dog anti-inflammatory drugs, weight loss, and undergoing physical rehabilitation for six to eight weeks. Your pet may be able function normally, although knee arthritis will eventually develop. If this fails, surgery will be needed. In larger dogs, surgery is recommended. The weight alone of larger pets is too much for the injured joint to handle. Larger dogs are likely to suffer without surgery. There are several types of surgery that can be used. It’s best to consult with your vet and a board-certified surgeon to decide which surgery to follow through with. After surgery, physical rehabilitation is needed just as physical therapy helps humans after knee surgery to speed healing. If treatment is not pursued, arthritis ultimately develops and your pet’s mobility will be compromised. We can control some factors linked to cruciate tears. Avoid obesity. It’s linked to too many problems, one of which is cruciate tears. The extra weight on joints increases the risk of injury. Excessive, intermittent activity poses a risk. Building up to heavy exercise will decrease chances of your pet being injured. Don’t push your dog! I see many pets that shouldn’t be doing heavy activity and they end up getting hurt. Dogs are so good at trying to please us that they will do more than they should just because we tell them to. Part of our responsibility is to be the voice of reason for them. Will my pet be able to be active again after tearing the ligament? The good news is yes! Your pet has an excellent chance of returning to normal activities. Hopefully, this problem is caught before arthritis develops. A successful outcome depends on many variables, but with TLC, the majority of cases turn out well. Stephanie Oba is a contributing writer and physician for animals in the San Diego area. Opinions expressed in this column are not necessarily those of The Rafu Shimpo.